Former Sweden and Nigeria manager Lars Lagerback has emerged as a strong contender to take over as Wales boss. "On paper it's an interesting job... you want to know about how they look upon the job and the organisation around the job," he told Sport Wales. "It's a lot... if they are interested, but we'll have to wait and see." Lagerback joins Ian Rush, Lawrie Sanchez, Brian Flynn, Chris Coleman and John Hartson as a possible successor to John Toshack as Wales' permanent boss. The 62-year-old Swede revealed that he had first spoken to Football Association of Wales technical director Osian Roberts on 28 September, while this week he has been in contact with chief executive Jonathan Ford. "The first time I spoke with anyone was in Madrid, when Uefa had the conference after the World Cup," Lagerback added. "I met the technical director and Ian Rush and we talk a little bit about Welsh football. "It was shortly after... Mr Toshack had decided to stop as manager, so they said of course that the job was open now for discussions. "I spoke to the CEO, Mr Ford, for the first time today [Wednesday] actually." Lagerback cut his international managerial teeth as Sweden Under-21 boss, before taking charge of Sweden B and then becoming assistant coach of the senior national side. Initially as joint-coach with Tommy Söderberg, Lagerback managed his national team from 2000 until 2009 and under him Sweden qualified for Euro 2000, 2004 and 2008, plus the 2002 and 2006 World Cup finals. That run of reaching five successive major finals - and his time in charge of Sweden - was halted by failure to qualify for the 2010 World Cup in South Africa and Lagerback tendered his resignation. However, Lagerback soon signed a five-month contract to take charge of Nigeria, leading the Super Eagles to the World Cup where they were knocked out in the first round. Lagerback was reportedly offered an extension despite the early exit in South Africa, but opted not to stay on with Nigeria. Should he be offered the Wales job and accept, Lagerback would become the country's first non-British manager. 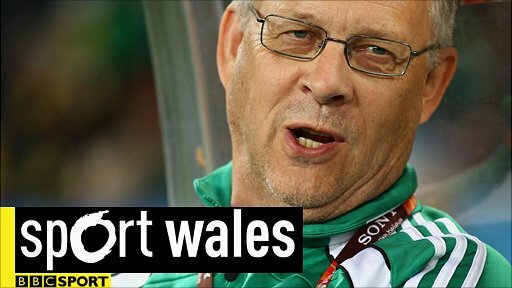 See Lars Lagerback's full Sport Wales interview on BBC TWO Wales on Friday, 18 November 2130 BST.